The wedding venue is one of the most important aspects of any wedding. The venue makes the scene for the wedding. You’ll look back on your wedding and cherish all of your memories from that venue. The venue also comes with amenities that are important for your wedding. That’s why choosing the best wedding venue is vital. But don’t think it’s easy to find the perfect wedding venue. Your dream venue does exist. To narrow down your options, here are 10 tips so you choose the perfect wedding venue. You likely have a vision for your wedding. You probably have had one ever since you were little. When searching for wedding venues, keep your vision in mind. Find a venue that aligns with your dream wedding as closely as possible. You may not be able to get every exact detail you want. But you can base your wedding venue off of your general vision. If you’re looking at outdoor venues, know the scenery you want. There are many wedding venue options for a beach, woods, and garden wedding. For indoor weddings, know if you want a specific location such as a church, or if a general wedding venue will work. Before you even start looking at wedding venues, hire a wedding planner and discuss your options. 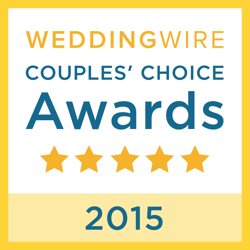 Wedding planners have the most experience choosing the best wedding venue. They will look at the number of guests, the type of venue you desire, and all of the details that will make your wedding unique. A wedding planner knows just about every wedding venue in your area. They will make recommendations and can even join you when touring the wedding venue. Are you having a big or a small wedding? Every venue has a maximum capacity. Before choosing the venue, make sure the venue can accommodate the number of guests you’ll have. But what if not every guest RSVP’d? Be safe and stick to the number of guests you invited. Too much room is better than too little room. If you know you’re inviting a lot of people, choose a larger wedding venue. You can also opt for an outdoor wedding to ensure your guests will be comfortable. Every bride and groom are too absorbed with their wedding visions, they tend to forget about their guests. Your wedding venue may be slightly inconvenient for guests, especially ones who are traveling. If you decide to have a destination wedding, the venue wedding can be even more difficult for your guests. Even if your guests aren’t traveling for your wedding, you want to ensure they’re comfortable and they have a great time. A wedding venue can impact your guests’ views of your wedding. A wedding venue comes with a myriad of costs. Renting the venue is the cost every bride and groom think of. But there are more surprising wedding venue expenses. Food, entertainment, and decor are just a few of the expenses you need to remember. And all of these can easily exceed your budget. Rather than keeping a budget based on the wedding venue, keep a budget for all of the small venue details. This will help monitor your expenses better. Plenty of wedding venues are full-service, meaning everything is included. This includes food, entertainment, and decor. This option is convenient but doesn’t leave much room for customization. If you’re looking at a full-service venue, ask what they offer and if you have room to change the accommodations. Some venues are okay with menu changes, hiring your own entertainment, and even bringing your own decor. But if you want to fully customize your wedding, it’s best to find a venue with no additional vendors. There are so many wedding influences that bombard the bride and groom. Family, friends, and the internet all want to have a say in your wedding. This is true for wedding venues. When you visit a venue, they may try and promote different services or ask to change your accommodations. Always remember: this is your wedding. Your wedding should be a representation of who you are. This includes the wedding venue. Another great way to narrow down wedding venues is looking at local wedding photographer portfolios. You’ll be able to see past wedding venues they shot and if a wedding venue aligns with your vision. Most wedding venues are staged during visits. But a photographer will catch the authentic wedding shots. This will help you decide if a venue you’re considering is up to par with your vision. Wedding venues usually have their season, especially outdoor venues. This is why choosing the wedding date before the wedding venue is a smart move. Beach venues have a summer season, woods venues have a fall peak, and gardens have a spring peak. Even indoor venues have a peak. Some venues have a busy season and a slow season. When inquiring about a venue, immediately explain the date and ask if they have availability. A great way to narrow down your venue options is by sticking with a theme. Many couples have color preferences that some venues specialize in. Other couples want to go by a theme that a venue has. 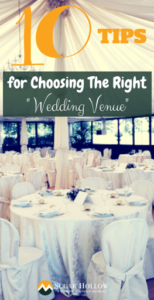 So your wedding is cohesive, choose a venue that correlates with these preferences. Before you say “I do,” you have a lot of planning to do. One of the toughest decisions the bride and groom face is choosing the wedding venue. When it comes to a wedding venue, know what you want and never compromise your vision. The wedding venue should encompass your dream wedding. Use these tips and have the best wedding ever! Are you looking for a wedding venue in Tennessee? Take a look at our location.